On the second night of the run, a respectable sized crowd filled the theater. The first act found ten strangers thrust together on a remote island, either as staff or guests, with no sign of their host. As they get acquainted, a record is played, accusing each one of a terrible crime. While they all have what seems like a plausible explanation for the accusations, they are understandably nervous and confused about what is going on. And then one of them dies. From there, the action is non-stop, with characters coming and going on stage, and one by one turning up dead. It quickly becomes obvious that the deaths are no accident, and tension builds as each character suspects another of being behind the murders. The set was a perfect representation of the interior of an island retreat, and the constant sound of the sea placed the audience on that remote island, far away from civilization. The effects of weather, power outages and off-stage discoveries of dead bodies were well timed and well executed. The cast is strong, and although there were some moments of struggle over lines which broke the flow on occasion, for the most part the show was fast paced and engaging. Each performer found subtle ways of making their character come alive, and also of creating suspicion and doubt to keep the audience guessing. There were also plenty hilarious moments, fueled by flawless timing and perfect line delivery. 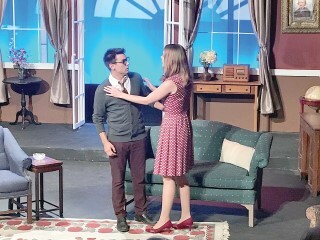 Of particular note were the performances of Zachariah Stearn as Phillip Lombard, Barbara Levault as Emily Brent, and Ricky Brewster as Dr. Armstrong. Each created and maintained a character that was both authentic and hilarious, making the moments that they were speaking incredibly fun to watch. Saying too much would detract from the fun of watching the story unfold, so suffice it to say that you won’t be bored. The audience was engaged throughout the show and gave the cast a standing ovation to show their enthusiasm and appreciation. The show runs for one more weekend, with performances on Friday, October 5th at 7:30 p.m., Saturday, October 6th at 7:30 p.m. and Sunday, October 7th at 2 p.m. Tickets are $12 for students and seniors and $14 for adults. Tickets can be purchased online at schoolhousearts.org or at the door.